Oh Summer. It is one of my favorite times to share a few brews with friends around a bonfire or on a back porch. With the longer days and warmer nights, you owe it to yourself to brew delicious easy-drinking beer. But what to brew?!?! Here are some of my favorite beers for the summertime; maybe they’ll inspire your next summer brew. For starters, there are two types of beer: ales and lagers. Lagers favor colder temps and have longer fermentation times than ales. Ain’t got time for that, so I’ll be sticking to ales for this post. This classic American style usually has a simple grain bill comprised of Pilsner malt (or Pilsen Light extract) and maybe one more steeping grain, such as light Munich, or flaked rice or corn, to add subtle hints of complexity. Corn sugar is sometimes used in amounts up to 20% of your recipe to dry out the beer, making this a smooth, classic summer beer choice. Wheat beers, wheat beers, wheat beers. There are so many takes on this delicious family of styles that the sky’s the limit. From the Belgian white beer with coriander and orange peel, the German weisse biers that can be heavy on the banana and clove, and the refreshingly tart Berliner weisse, to the American wheat beer, there are endless ways that this base malt can be used. Wheat beers are also a fantastic base for fruit beers. Canned fruit purees such as Oregon Fruit Products’ apricot, blackberry, blueberry, cherry, peach, or raspberry are simple to use because they are sterile and can be added to the fermenter without further processing. Dosage is anywhere from a fourth to half a can, depending on how much fruity character you want in the finished beer. Use less fruit when dealing with intensely tart or sour fruit. If you want to add spices, an ounce of dried bitter or sweet orange peel during the last ten minutes of your boil is great. This technique works well with coriander, lemon peel, tangerine peel, star anise, and my personal favorite, chamomile. This is an old standby of mine. Good in all seasons, the American Pale Ale can be just the beer you want on a hot summer day while mowing the lawn. When brewing an APA, I like to use (surprise!) American hops. 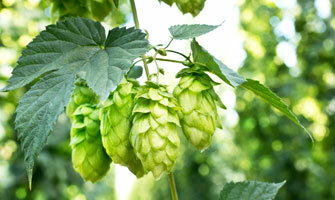 Cascade, centennial, citra and amarillo are a few of the classic choices. These hops bring out the wide variety of citrus and fruity notes that define this beer style. The new dual purpose hop, Mosaic, has been a huge hit in pale ales as well. Our Mosaic Medley Kit is a great beer that features nothing but Mosaic hops. Just because summer is approaching doesn’t mean you have to stick with only sessionable low ABV beers. However, some of my favorite easy-drinkers are Belgian beers. These beers are usually simple in their grain bills, using mostly base grain, or light dry and liquid malt extracts, with a few light steeping grains. One of my favorite styles is the Belgian Tripel. Tripels commonly call for Belgian candi sugar or beet sugar. Both of these are used to bump up the alcohol without adding more mouthfeel. Candi sugar comes in light and dark colors and beet sugar comes in a variety of colors ranging from clear to black. These sugars are typically added at the end of the boil. At the end of the day though, Belgian yeast and its distinctive characteristics are what truly define these beers. Luckily, many of these Belgian yeast strains favor higher temperatures, making them excellent to brew in the summer. Lambics are a commonly overlooked style for homebrewers because they take a LONG time to reach maturity. However, if you’re patient and have a spare fermentation vessel, lambics are dynamite. I have a lambic going now using Wyeast 3278 Lambic Blend. I brewed it in October and sampled it for the first time last month. The flavor was delicious. It was slightly sour with tart fruity notes. These beers just get better with time. The trick with these guys is to brew them and forget about them.. for years. Patience is a virtue. Saison, a beer that Randy Mosher, author of Brewer’s Companion, Radical Brewing, and Tasting Beer, describes as heaven’s lawnmower beer, is just that: heavenly. Slightly spicy and/or fruity, these beers make excellent candidates for experimentation with spices and fruit. Also, fermentation temperature plays a big role in the final taste of this beer when using the Wyeast 3724 Belgian Saison yeast strain. It’s important to keep the temperature in the mid 80’s to low 90’s. If this is an issue for you, use Wyeast 3711 French Saison strain, which works well at regular ale temperatures. There are so many good summertime brews; I’ve only listed a handful of my favorite ales without even touching the world of lagers. At the end of the day, what you choose to drink during the summer is completely up to you. 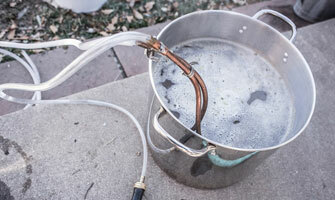 If I leave you with anything to prepare for your summertime brews, it’s that you should brew them early and often. Summer is a great time to showcase what you’ve been brewing to your friends and get them to find something new that they’ll love. As always, we at Great Fermentations are here to help put together all that you need for your recipe and answer any questions you have; and of course to try samples after its all done!